You may remember just a few days ago, T-Mobile launched a special promotional offer for customers signing up to Prepaid or Simple Choice No Credit customers. First off was the offer of a free SIM Starter Kit, and second was the special $50 price of the LG Optimus L90. In two days time, on May 20, T-Mobile is going to add to its collection of special prepaid offers. 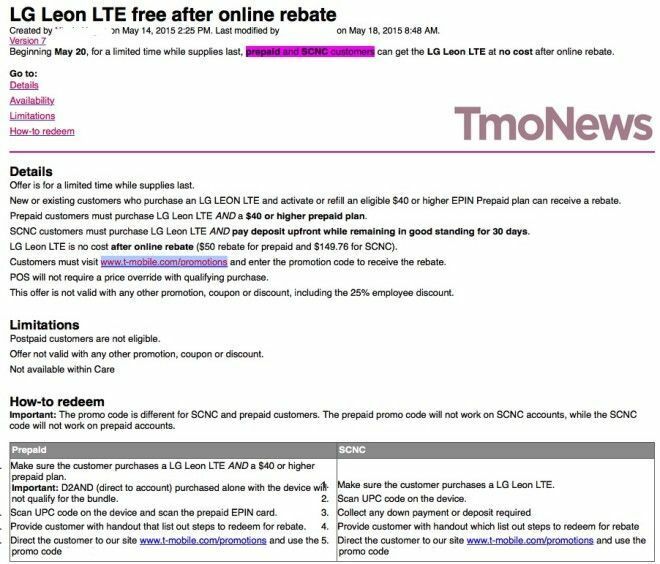 We’ve been shown an internal memo to staff which states that customers signing up to a $40 or higher prepaid plan or a SCNC (Simple Choice No Credit) plan will get the LG Leon LTE for free after rebate. We were previously informed that the Leon LTE would be launching on May 20th alongside the budget G Stylo phablet. This means that – right from the outset – T-Mobile will be trying to shift as many of these low-end devices as humanly possible by almost literally throwing them at their target market. How it works on both prepaid and SCNC will be different. The Leon has a full retail price of $149.76, that’s ($0 down and 24 monthly payments of $6.24 on EIP for regular postpaid customers). Prepaid customers will see the price dropped down to just $50 at checkout and then be able to claim the $50 back online as a promotional rebate. Customers on the no credit Simple Choice plans, however, pay $149.76 up front and then claim that amount back as a rebate online at T-Mobile.com/promotions. In the end, neither customer pays for the device, they just get different amounts as a rebate to take their effective tally to $0. From the staff side of things, retail employees won’t have to do any price overriding at checkout. On prepaid, it’ll automatically show as $50. On SCNC it’ll come up as $149.76. As for the LG G Stylo, it doesn’t look like that device is going to be part of any special promotions just yet. But we do have information on its pricing. It will cost $289.92 full retail price once it’s available on May 20. As of right now, both devices still show as “coming soon” online. But we’re pretty confident – unless plans change – that T-Mobile will launch both of them on Wednesday, as previously reported. Was hoping the Stylo would be $199 like Boost. Its a good middle ground between the entry level and the LG G3 which is at $450. Yes the math is wrong, 24 payments of $12.58 is a total of $299.52. Looks like my Zmax may become my backup phone soon. The Stylo’s specs are impressive at that price plus as a former Note user I miss having a stylus so that is a huge plus. played with it yesterday and its actually really great. camera is not great. Wonder if postpaid customers will have any special phone promotion soon, it’s been a while since they were selling phones at loyalty discounts. The T-Mobile website says it has band 12 LTE. LG Leon will also be free (After Mail-In Rebate) on MetroPCS starting tomorrow! Eh, it’s not a bad phone, but I wish it had 16 gb of storage rather than 8. 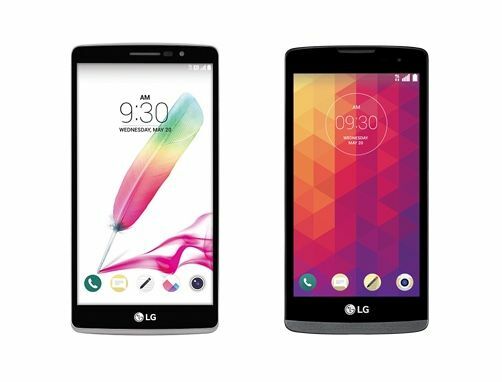 At least it’s not 4, like LG foolishly puts on many of its low-end and even midrange phones. One of the reasons I only buy its flagship phones, and turn to Motorola and Samsung for the midrange. The G Stylo being the exception to this of course.